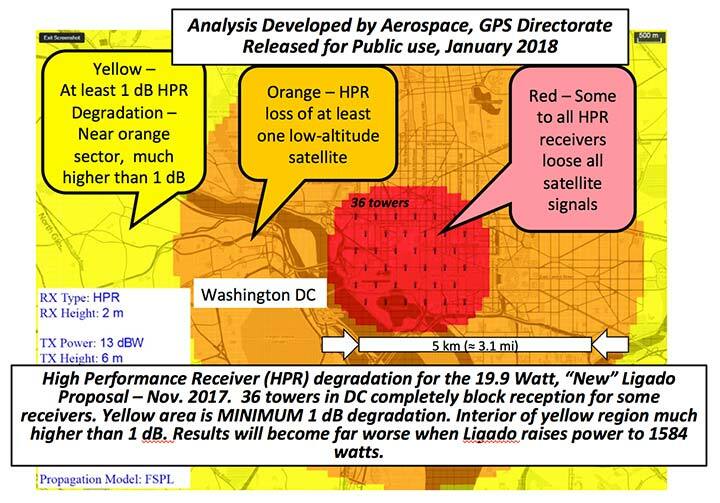 In the coming months, the U.S. Federal Communications Commission (FCC) may allow high-powered, ground-based, communication transmitters to broadcast at a frequency near GPS L1. U.S. Department of Transportation (DOT) tests have shown that such transmitters effectively become jammers for many existing GPS receivers. I believe that this possibility is the greatest current threat to the position, navigation and timing (PNT) community. L1 is the primary band for GPS as well as for similar GNSS. For example, the international signal called L1C is to be centered at L1, albeit with wider spreading than the current L1 civil signal, C/A. Why is this of critical importance? An economics study that only considered a small subset of benefits concluded that the U.S. alone realized $65 billion per year in direct economic value. A more complete recent study for the UK, extrapolated to the U.S., estimated the total impact of the loss of GPS to be over $3 billion per day for a five-day outage — a far greater rate. Virtually all GPS applications rely on the signals at L1. Thus, any threat to GPS is not simply an inconvenience, it would have great potential to do economic harm. The PNT Advisory Board (PNTAB)has been trying to protect PNT, particularly GPS, and at the same time accommodate Ligado, a company that has requested repurposing of nearby spectrum. At our November meeting, we reviewed the Ligado proposal and framed a response that will be made public in due time. Meanwhile, these observations and conclusions are my own. 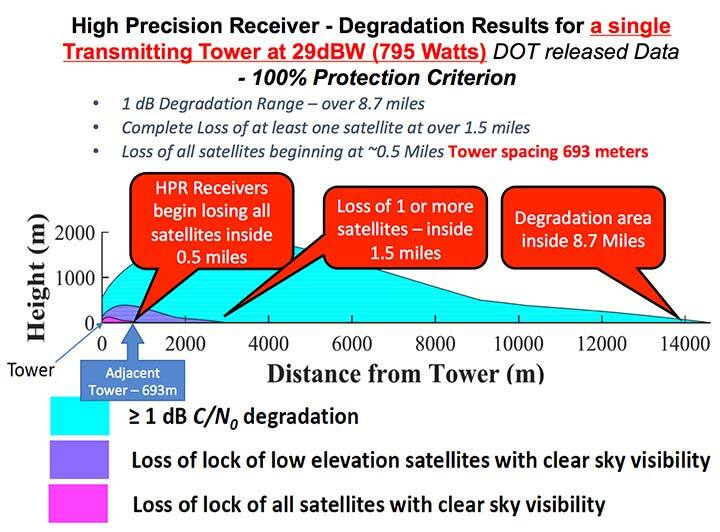 In 2011, LightSquared proposed that existing restrictions on its existing frequency authorization in the Mobile Satellite Service (MSS) band (a faint signal, satellite-to-ground) be waived so that the band is effectively repurposed to allow for high-power terrestrial transmissions. The company has two space-to-ground authorizations in the 1525–1559 MHz band (1526–1536 MHz and 1545–1555 MHz) very close to the GPS primary frequency (L1 at 1575MHz). Initially it requested repurposing to ground transmission of 42 dBW (15.8 kW). Faced with tests and analysis that showed this would be very destructive to GPS, it proposed to abandon the closer band and reduce power in the further band to 32 dBW, or 1580 Watts. Ligado filings suggest a spacing of approximately ¼ mile between transmitters. A GPS receiver would find even these weaker signals 5 billion times the power of GPS at the maximum range of ¼ mile. Most PNT users would be much closer. To ensure ranging accuracy, the international standard for interference to GPS is a 1-dB increase in noise levels. In conventional terms, this max allowable 1 dB is a 25.8% increase in background noise. The power of the weak GPS signal is only about 1% of the background radio noise. Sophisticated signal processing algorithms allow the signal to be reconstructed. The result: the international 1-dB standard is equivalent to a 25% reduction in GPS radiated power. The 1 dB is not simply to protect signal lock, it is to protect ranging accuracy. Most GPS receivers will stay locked for higher levels of interference but lose high precision. This is particularly a problem for high-precision receivers, which need relative timing to sub-nanosecond accuracies. These measurements are equivalent to the time it takes light to travel ¼ inch. Protecting such accuracies is of paramount importance to PNT users and applications. Allowing such maximum degradation from a single source is not the whole picture. There are many other potential sources of interference and attenuations of the GPS signal. For example, foliage may reduce the GPS signal. A receiver must cope with all of these difficulties. Allowing a single cause, such as the Ligado repurposing, the 25.8% equivalent reduction might be considered quite generous, but it is the accepted International Standard. Ligado has specifically rejected this criterion, largely because testing has shown that the Ligado repurposing would then be unacceptable for many PNT user classes. Lightsquared’s motivation in 2011 was clear: a $10 billion windfall profit (estimated increased value of the spectrum on open-market auction). The FCC did not confirm Lightsquared’s modified request, and in 2012 the company went into bankruptcy. Reorganizing as Ligado and emerging in December 2015, it continued to pursue repurposing of its spectrum, sponsoring tests by Roberson and Associates, and tests at National Institute of Standards and Technology (NIST)/National Advanced Spectrum and Communications Test Network (NASCTN) to establish test procedures. Both groups of tests were carefully reviewed by our PNTAB who found serious flaws. In general, Ligado rejected the 1-dB criterion and did not accept the need to protect all classes of users, particularly high-precision receivers. 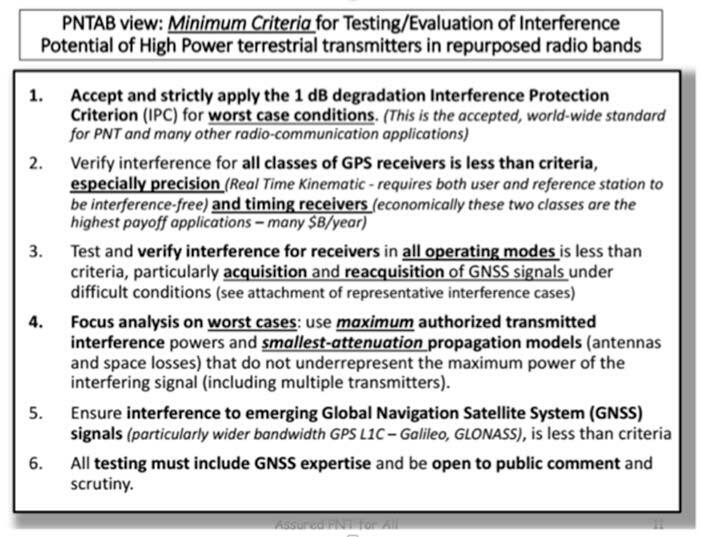 In addition, it did not consider the new GPS L1 signals (L1C and L1M), nor did it check the impacts on the international GNSS. The PNTAB assembled a 14-point summary of deficiencies and requested updates and corrections for the flaws. Accept and strictly apply the 1-dB criterion. Verify interference for all classes of receivers. Test and verify for all operating modes. Focus analysis on worst cases. Include the new GNSS signals. Include GNSS expertise and openly publish results. We believe it is a very reasonable set that aims to protect PNT users and our economic benefits. In its sponsored tests, and in representations to the FCC, Ligado has consistently overlooked a basic facet of radio ranging: it is ranging accuracy, not simply locking onto a signal, that is the fundamental objective for PNT. Both Ligado test sets clearly failed on all six points. While the Ligado-sponsored tests were neither independent nor adequate, the Department of Transportation, led by Karen VanDyke, sponsored a very complete set of independent tests; these are the most credible estimates of harmful interference. The ABC results have been made public. The PNTAB’s six points were published after DOT testing had begun, but DOT expanded and modified their effort to satisfy the criteria. The DOT conclusions, based on modeling real-world antennas and propagation patterns, are shown in Table 1. At 100 meters, all classes of receivers tested had results that would exceed the 1-dB threshold, even for the reduced power level (P2, 1580 Watts) that has been the most recent filing. The shaded square is particularly troublesome. It shows that, for the most susceptible high-precision receivers, the Ligado proposed power exceeds the 1-dB threshold by over 200,000. This result is particularly damning for the proposed repurposing, because it is this class that produced the highest payoff in the recent Department of Commerce Study — over $30 billion per year. These are examples of unintended and potentially hazardous consequences of repurposing. UAVs. Unmanned aerial vehicles (drones) will fly very close to the dense array of transmitters that Ligado would deploy. They usually require GPS for flight control. Even more important, if we are to monitor them and keep them from collisions, GPS offers the only viable techniques with 3D accuracy and almost 100% availability. Precision survey. This is routinely used in urban areas for building construction and is a major source of productivity gains. These survey receivers are all high precision and routinely make measurements to better than ¼ inch. Helicopters. These are found in urban area at all altitudes. They are used for law enforcement, rescue and passenger transportation. GPS is mainly used for general navigation. Public safety vehicles. Fire, police and ambulances use GPS for both navigation and dispatch tracking. In a city, they would drive in and out of susceptible high-interference zones. The PNTAB believes the DOT results are representative, accurate and credible. The National Coordinating Office for PNT also sponsored an evaluation of all testing to date. A summary report is now in coordination, as a combined Department of Defense (DOD) and DOT effort. Valerie Green, executive vice president and chief legal officer of Ligado Networks, represented Ligado. In the run-up to the meeting, the Six-Point Criteria had been sent to Ligado. Green did not address the six points at all. The 13 dBW corresponds to initial power levels of 19.95 W. However, Ligado has made clear in its FCC filings that it ultimately still wants a full 32 dBW base-station transmit power level, consistent with typical 4G/LTE networks. Tower Spacing. Green was very evasive on the spacing of transmitter towers. Clearly, at the reduced power level, greater density would be needed to carry the original data bandwidth. At about 1/100th the power, density would have to increase by a factor of 100, and the spacing would have to decrease to 1/10th for the same data output rate. Green referred us to an earlier filing which specified 0.25 mile, but did not clearly state that this was the plan; she claimed the details were proprietary. If this fundamental parameter, spacing, is not specified, it is hard to see the basis for the FCC evaluation of any new proposal. If the transmitter spacing is reduced to less than 1/10th of a mile, the sources of potential harm would be multiplied in a very worrisome way. Future power constraint. A public presentation does not ensure that Ligado will actually file and agree to abide by those power constraints indefinitely. Board members pressed Green on the permanence of the power constraint. She suggested it would be tied to the RTCA Minimum Operational Performance Standard. Revising the MOPS takes many years, if not decades, both to formulate and to implement. Retrofitting the commercial aircraft fleet is very expensive and time-consuming. Further, her statement focuses only on commercial aircraft, ignoring the high-precision classes as well as future signals. A modified summary chart (Table 2) for the lower power, based on the DOT ABC test results, shows that even at the lower power, the threshold for high-precision receivers is exceeded by a factor of over 3,000 at 100 meters. In fact, only cell phones, which are relatively inaccurate, could operate at 100 meters without exceeding the threshold. With these expectations and uncertainties, the PNTAB did not find the new revision acceptable to the PNT community. Ligado has steadfastly not accepted the realities of non-interference. 1 dB. Acceptance of the 1-dB (25.8% noise increase) International Interference standard is fundamental to protecting GPS applications throughout the country. All current and future uses. Users of great concern are emergency services, helicopter and general aviation, UAVs, and precision survey and machine control. For example, many of the underground utilities in the U.S. have been mapped with precision, GPS-based, geographic information receivers. This application requires sub-meter accuracy and operates in both rural and urban environments. Ligado has tended to simply focus on certified aviation, claiming that protecting that class of user is enough. The PNT community rejects that view. All current and future PNT users must be protected. Number of simultaneous interfering transmitters. A single transmitter situation is not typical; three or more are apt to be in range. The additive power must be considered. Propagation models. Propagation models for communications differ from those for evaluating potential interference to a navigation signal. For assured communication, a typical model assumes transmitted signal fall-off a little faster than 1/(distance squared). Ligado would naturally prefer to use this model, which is far from worst-case for interference. The early round of tests in Las Vegas verified the communications model would vastly underestimate interference levels, by factors of 10 or more. A more realistic model must be used. Degradation Radius. This is the size of the circle within which the International Standard is violated for receivers in a specified class. If the spacing of transmitters is 400 meters, and the degradation radius is 200 meters, virtually all receivers are in the degradation zone. Ligado suggested an appropriate degradation radius is 250 feet for aviation (approximately 100 meters). Thus, they claim the PNT community should tolerate violation of the standard when closer than 100 meters to their transmitters. At 400 meters spacing, 25% of the area would be in violation. But the ABC test results reveal a much graver situation. They show that, for the current Ligado proposal (1580 watts), the degradation radius is over 14 kilometers for high-precision receivers. See Figure 2. The 1-dB criterion is the correct, accepted and somewhat generous allocation of interference that can be accepted by the PNT community. We would hope that the FCC would continue to insist on this standard. PNT users must, yet again, defend the spectrum vigorously. Most of us are scientific and technical people. We are not used to discussions that deliberately avoid the technical issue or deny scientific evidence. We reject arguments that violate the fundamental laws of physics. We must be very leery of the new proposal by Ligado of 9–13 dBW. It still would violate the 1-dB criterion at 100 meters for many PNT users. Moreover, the company history has been to bait and switch; it has an authorization for MSS Ancillary Terrestrial Component (MSS ATC) stations to fill the gaps in satellite coverage with ground transmitters. These must operate in conjunction with the space-to-ground link that made them effectively self-limiting. However, in 2011, it almost succeeded in switching this to a ground-only system, which would have achieved a huge financial windfall. If the FCC continues to consider this proposal, there is one step that it should take before granting it. It should require Ligado to deploy an array of transmitters in its advocated configuration, and run real-world, open-sky testing to assess the harm that may result, particularly to high-precision accuracy. Such testing was done when the issue was first raised in 2011 and conclusively demonstrated unacceptable interference. Nothing has really changed from the baseline that was tested and found unacceptable then. The company should carry the full financial burden of such a verification, under PNT supervision. The government, having already spent millions of dollars to defend the spectrum, should not bear the cost of such retesting. Without this confirmation, it is hard to conceive of putting GPS and PNT at significant risk to satisfy investors who want to flip a company, after gaining “rezoning” permission for their spectrum. If we examine the situation without the technical details, we have this: Fundamentally Ligado wants to provide service using its allocated frequency band for an unlimited number of Internet-of-Things installations. It is not proposing a small, fixed number of transmitting towers located in isolated regions, but rather an accelerating deployment of private networks, many of which will be close to commercial and essential infrastructure where GPS use is critical. It seems unrealistic that Ligado can or will reliably guarantee that these widespread installations will be continually adjusted and monitored to avoid GPS interference. I believe the concept of allowing the installation of transmitting towers that, by design, will interfere with normal GPS use at some distance away opens the door to tacit approval of short-range (or not-so-short-range) GPS jammers. While I can commend the entrepreneurial spirit, the Ligado proposal seems very reckless indeed. The incremental value of an additional broadband transmitting system when there are at least five already in existence seems trivial compared to the potential damage done to the modern utility named GPS. I sincerely hope the FCC can find a spectrum swap or deny outright the current Ligado application.